I think many would agree that there is no phone accessory more important than a good case. I learned this the hard way when I dropped my phone, cracked the screen and ended up having to pay for it for the next two years. Never again. Since that day, I’ve made sure that every phone I’ve had has a case that can protect my phone long after my contractual obligations to whatever cellphone carrier I’m tied to. 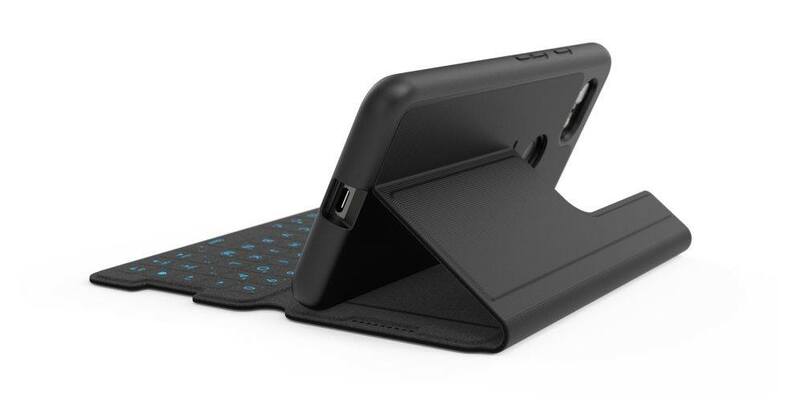 Enter the Tech21’s Evo Type case, which has a wallet-style shell with a built-in keyboard. Before we get into Tech21’s built-in keyboard case, I want to share an embarrassing story. Last December I was able to finally upgrade from my Samsung Note 4 to the Pixel 3 XL. Even now, I still have my Note 4 and though it doesn’t run as fast as it did when I first bought it, I think it’s safe to say that I got the full worth out of the phone. And that is in part thanks to Tech21. Before you even ask, yes, I got the Note 4 at launch and I absolutely loved it. At that time, it hands down had the biggest screen on the market, unless you were a huge phone snob and bought the Samsung Mega at full price outside the US. The experience of breaking a new phone scarred me for life. More specifically, it was an LG G2. I literally brought it home from the store after saying “no” to the Protection Plan and “no” to the customer service rep’s suggestion for a case. Lesson learned. When I finally decided to upgrade to the new Note 4, I wanted to make sure that my case would protect from all the elements. I had an Otterbox. I had an Incipio. I’ve had a Ballistic case. They all failed me in some way or another and resulted in the screen being scratched or chipped. 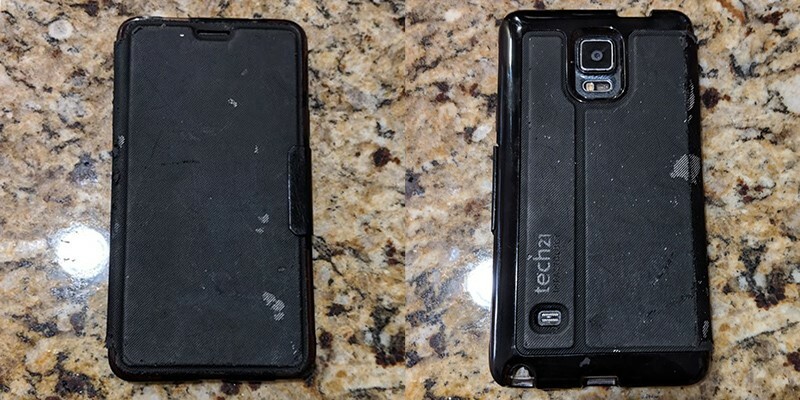 So when I finally bought my Note 4, I noticed a case that was fully enclosed, a design that was not very common at the time, and it was the Tech21 Impactology Classic Shell Wallet. It’s a case that would literally keep my phone running, scratch and crack free for the next 10 years. Since that time, my Note 4 has survived four Comic-Cons, three E3s, the jungles of Hawaii and a snowstorm in Denver. Safe to say when I picked up the new Pixel 3 XL, I immediately looked up what Tech21 had in store. Sadly, to my surprise, they only had the open-face cover phone. While they were definitely intriguing, I wasn’t about to put this nearly thousand-dollar phone in jeopardy because I couldn’t find a substantial case. I must have literally spent half a day on the internet looking at phone case reviews and ultimately came to the conclusion the wallet design was no more, and I’d have to just buy a standard case. I was devastated. I was able to buy a “wallet” phone case off of Amazon. It had a lot of the same qualities but not enough protection and security. Enter Pepcom during this year’s CES 2019. Multiple tech vendors from all over the world come to the event to showcase their products in a much more relaxing environment outside of the big convention. There are free drinks, food and less pressure to run around to get appointments. One of our writers came up to me and said, “Mike, Tech21 has a keyboard case for the Pixel!” I immediately made a b-line towards the Tech21 booth. 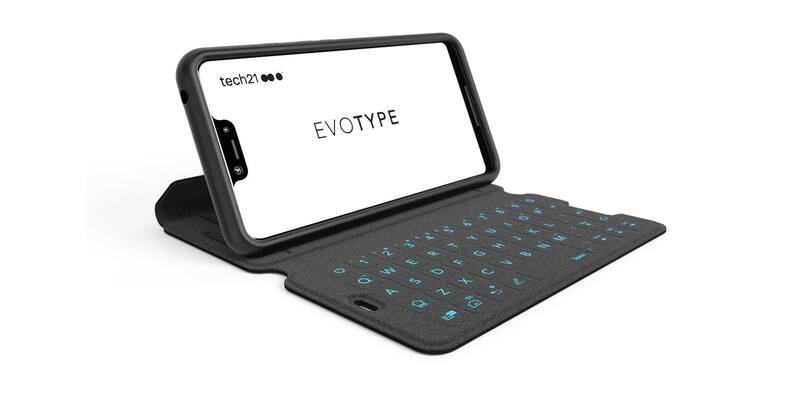 The Tech21 Evo Type case uses the very similar wallet-style shell but with a built-in keyboard. I actually laughed when I noticed how similar the design was. The case still fully covers the phone but has functionality that still allows you to press the volume and power buttons. The case still gives users clear access to the Pixel 3 XL’s Finger Print reader and even has vent holes around the front and rear speakers. The case seamlessly integrates the keyboard into the actual case itself. Using an NFC connection, the keyboard wirelessly connects to the phone and has no visible lag between keystrokes. Much like my old Shell Wallet, you can use the case’s materials to prop up the phone once it is open with the keyboard fully extended. The only downside I see is that the band that is used to keep the case closed. Its style is very reminiscent of the leather ties on Doctor Jones’s journals of lost artifacts. While I don’t have a huge gripe with this design, I am concerned about the elastic band. While I wished I could have gotten more time with the Evo Type, I can clearly see its necessity and usefulness. I can’t tell you how many articles I’ve written on THIS very website that was completely composed using my phone during an event, even though I had a laptop. To me, this is perfect for anyone who wants to be part of that Blackberry/Flip-Out Keyboard cellphone generation. Yes, I was a part of that generation. Somethings just can’t be typed out over Swype or the screen keyboard, and I am eager to see how well the product does at full launch. There is currently no release date for the Evo Type, but it will be out later this year. They do plan to also have an iPhone compatible version. Here’s a look at my Tech21 Note 4. 10 FREAKING YEARS!